In my Mac Pro review I lamented the state of 4K display support under OS X 10.9.0. In my conclusion I wrote: "4K display compatibility under OS X is still a bit like the wild west at this point". Compatibility was pretty much only guaranteed with the ASUS/Sharp 4K displays if you cared about having a refresh rate higher than 30Hz. Even if you had the right monitor, the only really usable resolution was 3840 x 2160 - which ends up making text and UI elements a bit too small for some users. Absent were the wonderful scaling resolutions that Apple introduced with its MacBook Pro with Retina Display. Well it looks like that won't be the case for long, last night I got reports (thanks Mike!) that the latest developer build of OS X 10.9.3 includes expanded support for 4K displays, 4K/60Hz support for rMBPs and scaled resolutions below 4K. 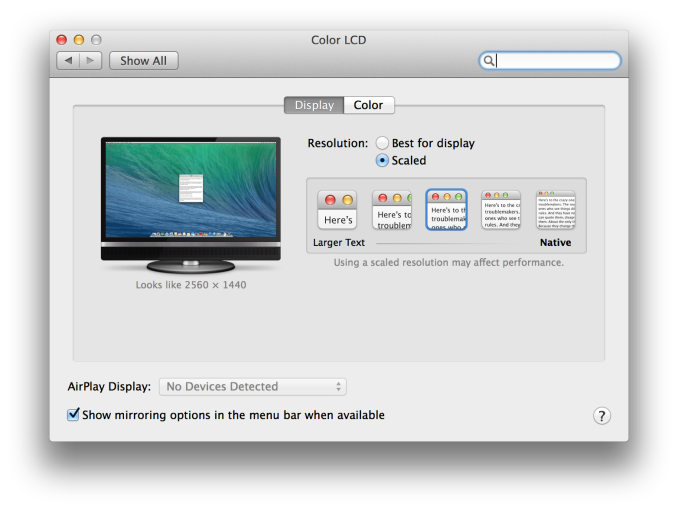 For starters, the list of compatible displays in 10.9.3 extends beyond the ASUS/Sharp models. The 32" and 24" Dell 4K panels are now supported, and I'm guessing the < $1K 28" 4K monitors should be supported as well. You could drive any of those panels prior to 10.9.3 but not at 60Hz. The display preference pane now includes support for scaled resolutions just like on the rMBPs. The default in 10.9.3 is still the panel's native resolution, but you now have the option to choose 3200 x 1800, 2560 x 1440, 1920 x 1080 or 1280 x 720. All of these options are treated the same way that the rMBP's scaled resolutions are handled. In the case of the 2560 x 1440 setting, your display is rendered at 5120 x 2880 with text/UI elements drawn at 4x the size (2x in each dimension) and images/video in supported applications drawn at 1x size (1:1 pixel mapping). 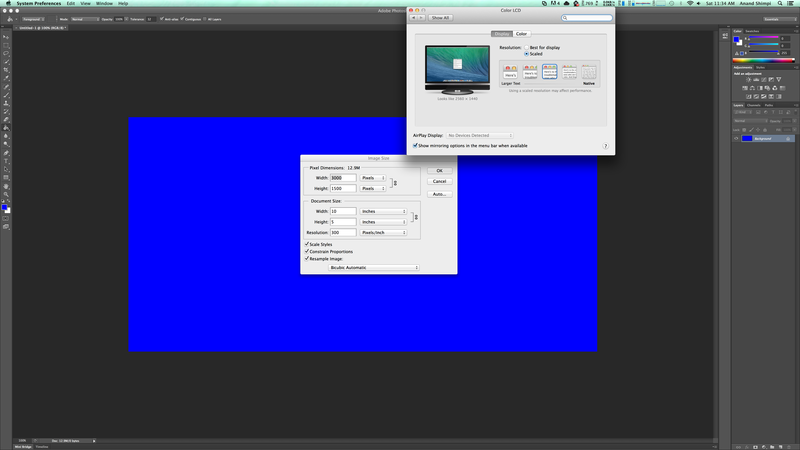 Once the frame is built, it's scaled down to fit the panel's 3840 x 2160 resolution - giving you a fairly sharp image. I suspect Apple is using their own filtering algorithms here as well in order to ensure maximum quality for the downscaled image. You'll also notice that despite the ultra high off-screen resolution, all text/UI elements appear as if they were drawn on a 2560 x 1440 display. That's the 4x scaling at work. Prior to 10.9.3, you could force some lower-than-native resolutions on 4K panels but you'd get a lower res desktop upscaled to fit the panel, without any of the HiDPI benefits I just outlined. There may be a performance impact to the scaled resolution settings (the 3200 x 1800 option actually draws your screen at 6400 x 3600), particularly if you're driving a 4K panel off of an rMBP but I suspect any of the beefier Mac Pro configurations should be fine. This is definitely something to look at once 10.9.3 goes final. This is a huge step forward in improving the state of 4K under OS X. The 10.9.3 update is a smaller update than 10.9.2 (~200MB vs nearly 800MB), which took around two months from initial seeding to final release. Sure, a bit earlier would have been ideal, but I come here for technical details, not speed. So I would still read it, and isn't that what counts, really? 1) I agree, but historically they tend to release their in-depth reviews within a month, not six months. I assume it will take a good 2 months for 10.9.3 to be released to all Maverick users. That puts us just before the usual time for WWDC. I also think that WWDC is a great time to introduce an expensive, professional Apple 4K (or UHD) display with a TB2 hub supporting GigE (I think 10GigE is unlikely… ever), ≥3xUSB3.0, HD FaceTime camera, microphone, speakers, additional TB2 port. MagSafe and Kensignton lock, too (the latter of which is oddly missing from the new MBPs). I would expect FW800 to go away and expect it to match the new iMac design.